Do not shift to the “N”(Neutral) position while driving. Doing so may result in an accident due to loss of engine braking. To change gears or when upshifting or downshifting, depress the clutch pedal fully, shift into the appropriate gear, then release the clutch slowly and smoothly. 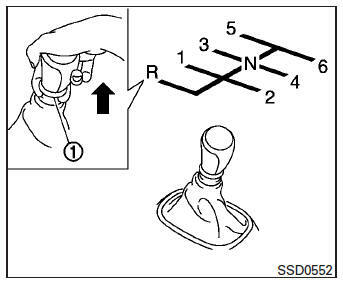 To ensure smooth gear changes, fully depress the clutch pedal before operating the shift lever. If the clutch pedal is not fully depressed before the transmission is shifted, a gear noise may be heard. Transmission damage may occur. Start the vehicle in 1st gear and shift to 2nd, 3rd, 4th and 5th up to 6th gear in sequence according to vehicle speed. To back up, lift up on the shift lever ring 1 and then move it to the R (Reverse) position after stopping the vehicle completely. The shift lever ring 1 returns to its original position when the shift lever is moved to the N (Neutral) position.